The original Stretch Armstrong is Back! Stretch him, pull him and tie him in knots. When you release him he will use his super strength to return to his original shape! 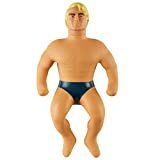 Stretch Armstrong can stretch up to 4 x his original size. Strongman Stretch Armstrong has his cool retro look ready to fight crime for another generation! For ages 5 plus years. Strongman Stretch Armstrong has his cool retro look ready to fight crime for another generation! For ages 5 plus years.